We've been doing SHS for almost 2 years now! WOW! 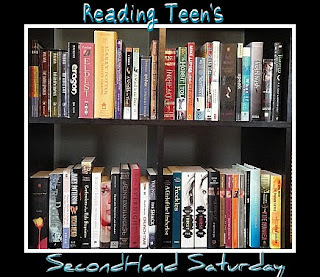 How long have you participated in Second Hand Saturday? This is my first time doing SHS. Thanks for it! This is my first time :) I like this idea! I have entered a few second hand saturday. The first time should be in last year. I always visit the website to see this week questions, IMM, review. The questions are quite unique and I love them! I've only entered a few times so far. :) Thanks for doing it! I think this is my second time, too! Such a great idea. About a month, I'd say... but I had entered before! Thanmks, and I hope I win! It's been a long time, I'd say more than a year but I don't remember exactly... Thanks for it, it's very funny! I've only just come across book blogs and the like over a month ago (how did I ever find great books before!?!?). I think I've only caught two of your SHS. I just got here so I guess I'm a SHS virgin, nothing wrong with that. I'm not sure, I think it's probably been a year? Man, time goes quick! Not too long, I think. This is actually by first time even though I've been following for over a year! I have been participating for a couple months. Thanks for doing it! since november. the second week of november. i'm counting the weeks and days lol./ i've never won something. This week will be my first time participating! Thank you so much! This is my first time to enter! I've been following your blog for a while now. On and off for the past year. Maybe if I were more diligent I would have won something by now. I've been participating for a few months now. This is my first! What a great idea! Thanks! I started doing Second Hand Saturday 6 months ago (around the same time I started to follow the blog). I think this is my second or third time doing SHS. This is my third time participating. I've been participating for over a year now!! Like 6 months!! hahaha! Hopefully I win something soon! I feel like its been forever now. A long time. At least a year I would say but I have missed a few. I participated when it first started but it has been a long time since I have entered. I've been following Reading Teen for a month now and I especially like your reviews and the fact that you post daily. I think it's interesting how you do this as sort of a family hobby. This will be my first time. COngrats on the 2 years. I would say i've been playing off and on for about 1 year. I think possibly a year, although I don't seem to make it every week :) Thanks for another chance at these books! Only for a few weeks. (: It's an awesome idea! Congrats on 2 years! I think I've been participating for half a year. Thanks for another great giveaway! This is my first time. So...Think Positive thoughts?